The Preh KeyTec MCI 111 has been discontinued. No direct replacement is available. 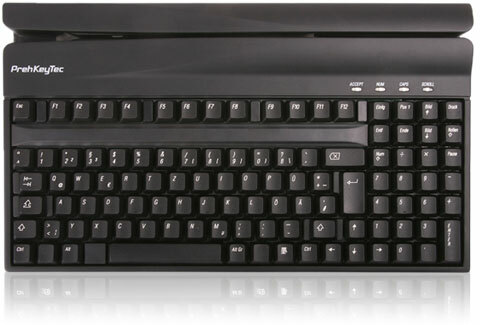 The Preh-KeyTec MCI 111 is a compact alphanumeric keyboard featuring integrated OCR and MSR modules. Advanced ergonomic design of the keyboard allows for an easy bi-directional swipe by the user. The MCI 111 is designed for reading passports, visa data, utility bills, bank checks, credit and debit card data, and all other personal documents containing data on a magnetic stripe or in OCR-A or B format. The (optional) 2D barcode reader reads labels, tickets and all similar items. Our keyboards are ideal for use in custom control areas at border crossings, airline ticket counters or cashier stations at utility companies. Use of the MCI 111 keyboard assures perfect reading of all information stored in machine readable documents.